Facebook, Snapchat, WeChat, WhatsApp, Line… the messaging apps just keep on coming—and they’re going to determine the future of your marketing, communications, and customer service strategy. According to eMarketer, messaging apps were used by over 1.4 billion people worldwide in 2015 (a 32% jump from 2014) and that number is expected to hit 2 billion by 2018. So, the secret’s out; messaging apps are going to be huge in marketing. Are you ready for them? 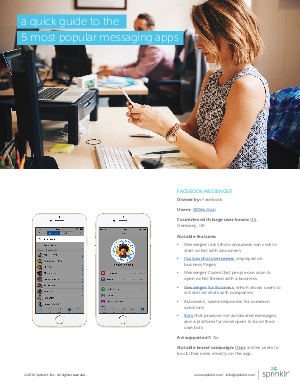 Download this Fact Sheet to get the stats on the Top 5 Messaging Apps, to take advantage of the messaging app revolution and boost your marketing strategy.